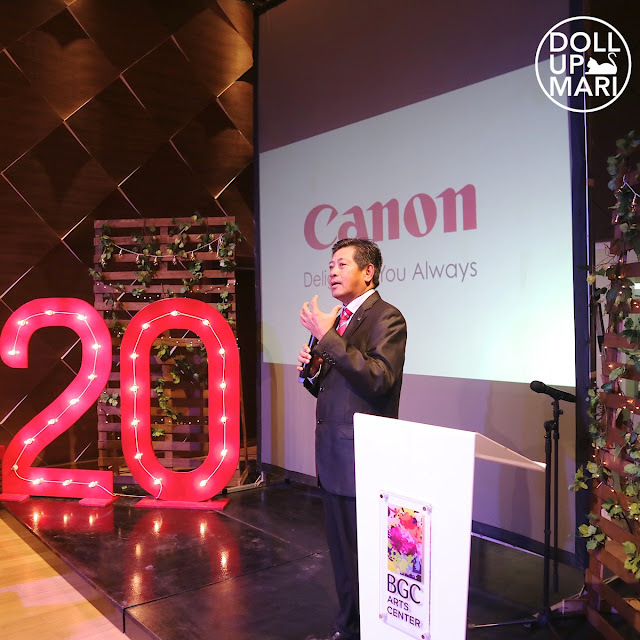 Happy 20 years in the Philippines, Canon!!! And happy 80th birthday this August!!! 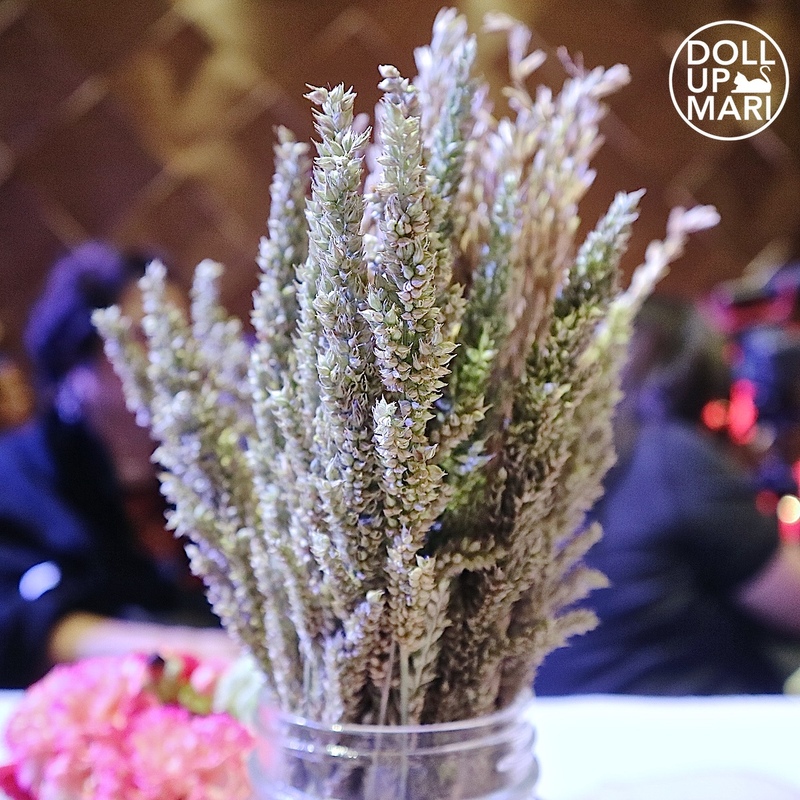 I only have a few photos for this post because I think this is gonna be a wordier and chismis-filled post. 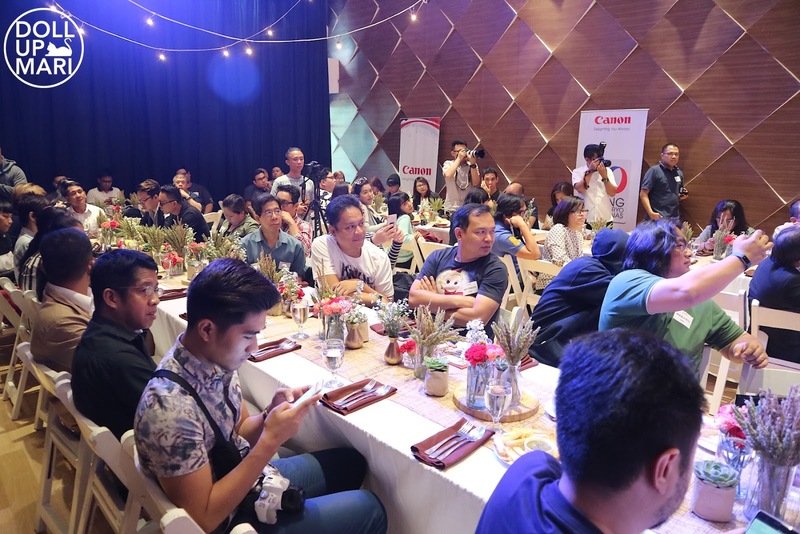 I don't know but I felt so emotional attending this event XDDD It was honestly just a very good lunch (and the best brewed coffee ever) with talks from Canon executives. But perhaps what makes it so special is that from birth, I've already been on Team Canon. My mom is an extreme photo enthusiast, and by enthusiast, I mean legit enthusiast, not the pouting selfie addict we all are today. My mom used to join photography clubs and contests, saved up for tons of SLR's and accessories, and made each photo count on film! In the 80's! I can never be the photographer my mother was because back in the day, my mom had to compute all the settings, list them down on notebooks, and plan before pressing the button because film is so costly. It's so important to get things right. Even contests were crazy! She told me that they'd take photos, submit the films, and then the organizer would develop then judge the film's photos. Nowadays everything can easily look good with filters, photoshop, and lightroom. Not to mention that when I take photos, I take at least 3 shots of the same item on the same layout to be sure. I don't think my mother would have been able to take 3 photos of a lipstick doing the same pose and repeat the process for 3-4 more layouts, and then do that for 100+ lipsticks in a year without drowning in debt. 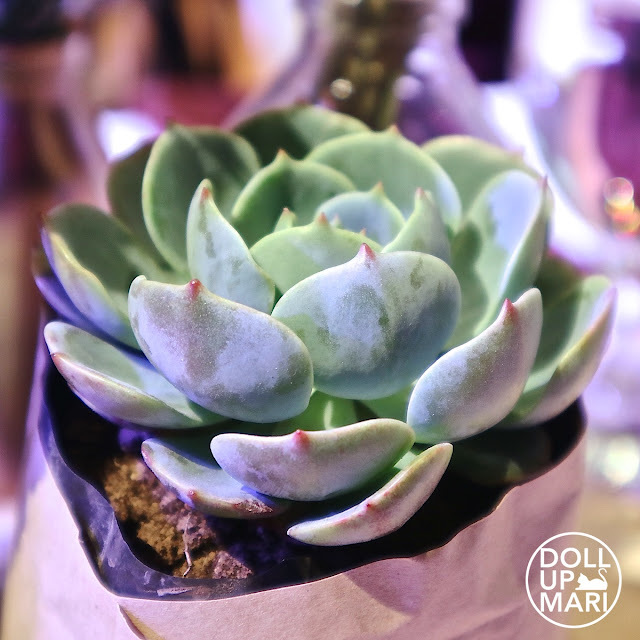 Team Doll Up Mari will edit heavily, rely on autofocus, and will die if the viewfinder isn't there. Team Mama Doll had to get things right in a 24-shot film, had to manual focus, and lived through the days when the viewfinder wasn't there. My mother's love for photography means that when I was born, I had a 1 minute old photo, a 5 minute old photo, and basically photos of every hour after I was born, and imagine this was the film era. 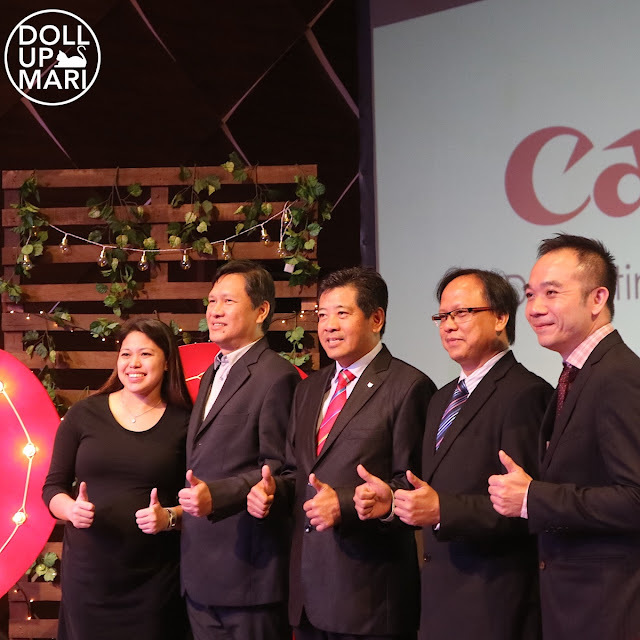 Mama has also used competitor brands, but what made her stay with Canon through all these years is that it basically is the best. This is why when her kids (us) got interested in photography, it was Canon all the way. All the cameras we've consciously purchased in this house is Canon. We have other brands, but they were either gifts or sale purchases. The camera purchases that we reaally planned for and researched for, all of them were Canon. All of the cameras in active use in our house now are Canon. In fact, 99.5% of the posts in this blog were taken with Canon cameras, with the 0.5% taken with phone cameras when cameras could not be used. I guess I'm so emotional because this event makes me so nostalgic with a lot of family memories and the beginnings of this blog. Our Europe trip in 2009 and plenty of trips before and after that were documented with a Canon G10 and a retired IXUS camera. My first ever makeup tutorial (which I regret I deleted because I felt so bad that I didn't win the contest I entered it for) was filmed with my brother's EOS 5D Mark II. My early forays into blogging were done with the Canon S95, and I was so thankful my mother had it even if it had no rotatable screen and I was out of focus as a result 60% of the time. I remember thinking of whether to get a 60D or a 70D 3 years ago when I thought I wanted to take things to another level. I remember going home from the store with my EOS 70D, tinkering with it, not knowing that it is capable of so many things I never knew it was capable of. And until today I am astonished about the new things I find out it can do. When my 70D suffered a motherboard breakdown in August 2016 with less than a week to go before I went on a blogging trip, my long postponed plans of getting an EOS M3 had to come into fruition. I've long eyed the M3 because yielding an SLR during events has taken its toll on my neck and shoulders, but I was also thinking of saving up for a new lens instead of a new body. That event changed my plans. I thought that after being on a DSLR for so long, my readers would feel the difference of a mirrorless camera. But to my shock, reception was good, and it showed me that the instrument is only one thing, the user is another. I don't know if it's just me but I often associate the instruments with the memories. Especially when it comes to this blog. But well my feels aside, Lim Kok Hin, President of Canon Marketing Philippines, gave his opening remarks. His speech and a lot of the questions during Q&A brought up a lot of insights about the world today. Canon is in an interesting era. Everybody now has a smartphone that has a camera, but why is Canon still alive? Apparently, Canon's mass market cameras are weakening, but their SLR's are strengthening. And through their growing SLR market, they still win in life given how much more their SLR's cost compared to simple digicams. And given that one SLR will lead to many lenses, accessories, remotes, flash lights, and so many other add ons, they can take their first walk as Miss Universe anytime soon. They realized that smartphones are not necessarily their enemies because the more selfies and photos people took with their phones, the more they realized that high quality photos are important, and the more they longed to have SLR's because they want instruments that can do what their smartphone cameras can't. Smartphones have made it easy for everybody to get introduced to photography, and perhaps easier for people to see that it takes a village (of instruments) to make an IG worthy feed. Smartphones have actually enabled people otherwise unable or previously uninterested to explore photography to do so. Cameras are not cheap, disposable instruments that people will randomly buy, so there is a need for that push for people to feel that they need cameras. Contrary, too, to popular belief, their printing business is doing great even if no one develops films anymore. People sort of just transitioned from developing films to printing posters, tarpaulins, and basically printing everything that can possibly be printed on any possible surface that can be printed on. People are now living large because it's so much more affordable nowadays to print posters. Most tickets, print ads, invitations and other layouts are now printed out with unapologetically all the colors of the rainbow, often on paper sizes so large that it'd cost a fortune to do such things 20 years ago. If my cats' photos have big printouts, then I am quite sure plenty of other things have been printed out in this world and Canon printers have played a part in them one way or another. To talk about their exciting activities for this year, they have Kristine Dacanay, Marketing Communications Manager, go onstage to talk about their plans. 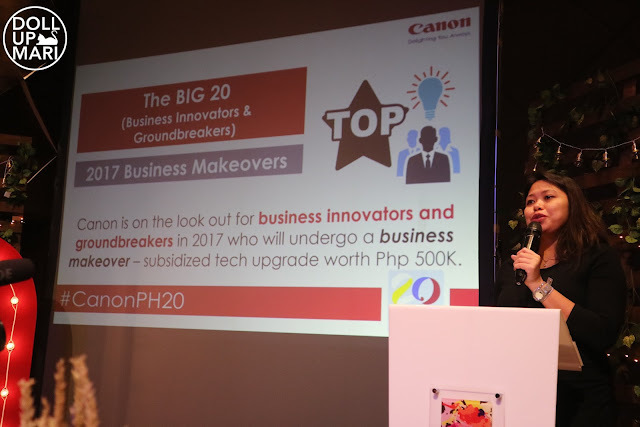 Canon is now a strong player in business solutions so they have a lot of initiatives for offices this year. Since it's their 20th, they have plenty of freebies, discounts and sales coming up! You can check their pages for all the specific information. The interesting thing is that they are also planning to rollout a program wherein owners of SLR's that are double digit and higher (70D or better) will be able to have their units picked up and delivered at the comforts of their own homes whenever repairs or services are due. They are also planning to rollout purchasable extended warranties for SLR's, something that they previously had just employed for their professional printers. 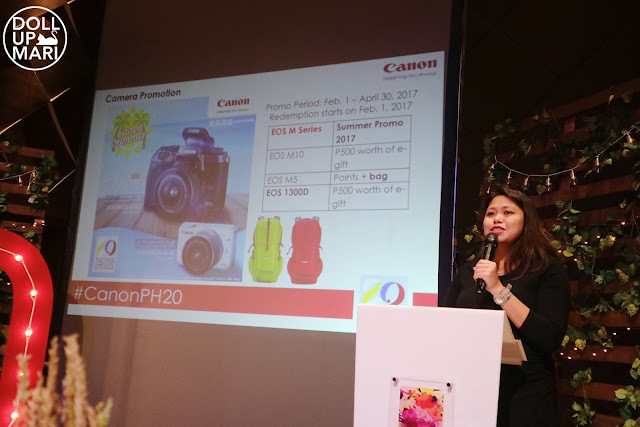 I am literally monitoring updates for this program like crazy because my SLR's 3 year warranty is ending this February (on EDSA day to be exact!). They understand that they have so many units out in the field and that many people would be interested in the extra protection, that's why they're having this soon. If I understood correctly there is also a cleaning program in the works for this paid extended warranty program, so if ever, it'd be their way of motivating clients to uphold the maintenance of their units to the highest level. As for the chismis part, they are also coming up with concrete ways to deal with grey market cameras. 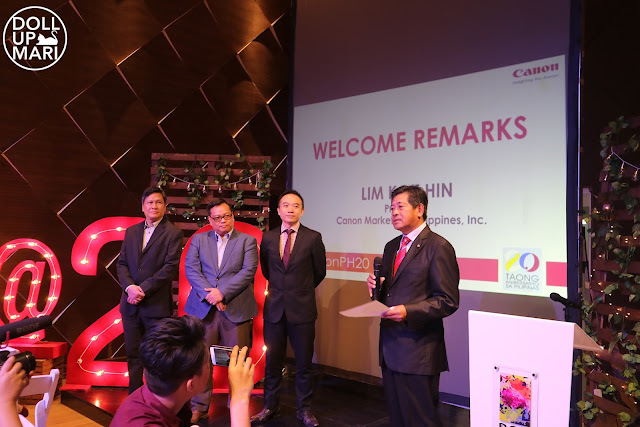 While it's not yet clear, they will be having some sort of a rewards program for families who buy legitimate units from legitimate stores and distributors. I think it will have a points system kind of mechanism. Canon will also slowly sever ties with distributors that have been discovered to have been mixing grey market units with their legitimate units, and they will do more policing on their 3rd party distributors, which I think is very important. But the biggest chismis of all is that it's only that I was writing this post that I learned why Canon is called Canon!!! I have wondered all these years why Canon has 1 n while the real spelling of cannon is supposed to have 2 n's. 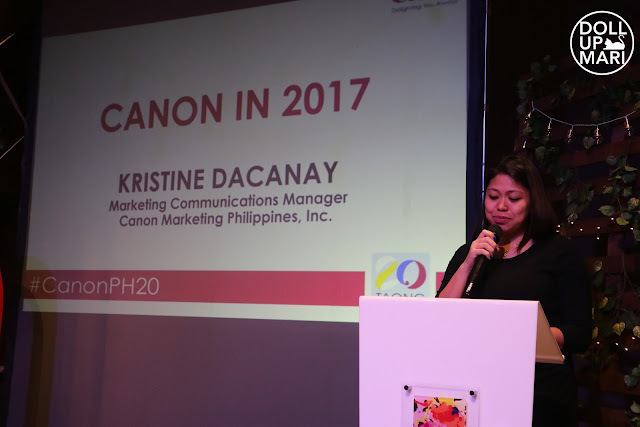 Apparently, Canon came from Kwanon, "Kwanon" being a transliteration of Guan Yin (we say it as "KwanIn"), the goddess of mercy in Buddhism. I am so mindblown. If I told my devout Buddhist grandmother about this, I think she'll buy an EOS 1D ASAP. Even my mom was pleasantly surprised to know this! Who would have thought, eh? And yaaay, just to end this post, of course I took photos of the centerpiece items using my M3.